Since living in my own apartment, I’ve become much more interested in decor. I remember when I was younger though, and my mom hired an interior decorator. I loved sitting and hearing her ideas, looking through her books. I remember giving my opinion and the older woman looking at me and telling me I had a good eye. And as I’ve gotten older, I’ve been discovering my tastes and styles. 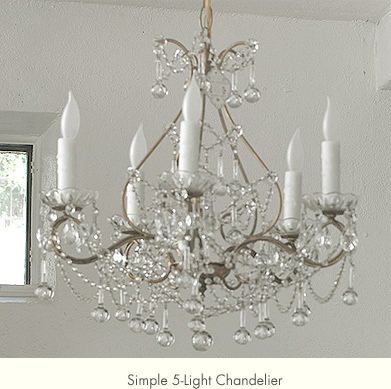 And I absolutely adore chandeliers. I love them in everyday rooms, like bedrooms, offices, casual living rooms. And this Shabby Chic one is just lovely.